Playing aggressive blues/rock in the blazing tradition of the guitar phenomena of the world, this group features the only female to ever qualify for the finals of the Rock N Roll Hall of Fame's national lead guitar competition. 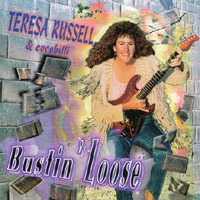 Teresa Russell is without question the finest female blues/rocker that I have heard. She is a legitimate blues/rock triple threat in that she is an excellent vocalist, intensely personal songwriter, and an emotionally charged and powerful electric guitarist. Teresa Russell....That woman can rock! Teresa, is the only female to ever qualify" in the top eight" for the national finals in the Rock & Roll Hall of Fame's lead guitar competition. Competing with over 2000 guitarists across the country, she accomplished this by winning the West regional in Los Angeles where she received "out-of-seat-thumbs-up" kudos from such Grammy award, celebrity judges/guitarists as Steve Lukather (Toto) and Steve Stevens (Billy Idol). Teresa was playing on the Sunset Strip in Hollywood by the age of 12. With heroes like Hendrix and Clapton guiding her creative path, she rocked regularly at Gazzari's and the Whiskey A-Go-Go during a time when all of Hollywood was checkin' out those two bars. TV appearances followed as well as a movie called "The Young Graduates." Then, after attending Californian State University on a guitar scholarship, she hit the road to further season her rock chops in countless roadhouse bars throughout the western U.S. Touring the world with Helen Reddy throughout the late 80's, she was often seen on both live TV and at major concert venues. Teresa has now come full circle back to her Hendrix and Clapton roots, pulverizing agressive blues-rock guitar within a power-trio format. Her vocal style has been compared to such divas as Janis Joplin, Melissa Etheridge, and Bonnie Raitt, but she combines a rock-hard edge with a supple warmth that quickly distinguishes her voice as uniquely her own. Coco Roussel came to the USA in 1980 from Paris, France. Establishing residence in Washington, D.C., he performed with such notable acts as Clearlight Symphony, Happy the Man, Michael Manring, and David Arkenstone, among others. Coco moved to Los Angeles in 1990, playing with such R & B acts as Jeannie Tatum and Carol Diamond. After searching for a more improvisational attitude, he found a musical home with TR&CB. Billi Breland moved to LA in 1982 from the Mississippi Delta. Playing bass and contributing vocals, he has since toured, recorded, and performed on live TV and radio with such artists as The Original Blues Prophets, Helen Reddy, Alan Thicke, and the jazz group, Pocket Change. He produced the top-40 European hit, "Tear Down The Wall," for Joe Esposito. Billi met Teresa when both were touring the world as supporting musicians with Helen Reddy, celebrating post-concert euphoria in bars from San Francisco, CA to Beijing, China. He joined forces withTeresa in 1998 to co-write, co-produce, and pursue the energy, integrity, and exposed truth of an aggressive blues/rock sound. Pourtant , le blues est tres aimé ici et ce cd est vraiment dans la lignée des plus grands... les chorus sont superbes, la voix de Teresa l'est encore plus ... à quand une tournée en France?